I'm not sure what you pay for energy each month, but combining natural gas, gas for the car and electricity, I'm way over $250. This guy, Mr. Mike Strizki, does it all for nothing. In an interview for GREEN.MNP Mike reveals his many secrets. And none of them are secrets at all really. His background as a civil engineer obviously helped, but with a little studying, some major up-front cash (the 'catch' to the story) and some serious hard work, there's no reason we couldn't all go green and save the planet (and some green) in the process. Combining solar power, wind power, a hydrogen-powered car and a few other super inventions, Mike has unplugged his New Jersey home from the power grid. Maybe one day we can all live this way. But with the amount it costs to set up, probably not. Yet, anyway. 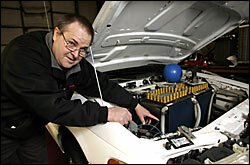 Below: Mike Strizki demonstrates his Hydrogen-powered car. OK, so your bill is $250.
" The total cost, $500,000, was paid for in part with a $250,000 grant from the New Jersey Board of Public Utilities. " So unless you expect to live for 100 more years or are filthy rich you may as well forget it. Major up-front cash. But if more people did it, the technology would become more widely available, and that would make it a whole lot cheaper. Only a few years ago Hybrid cars were prohibitively expensive.